Public Choice: A Primer | Inertia Wins! 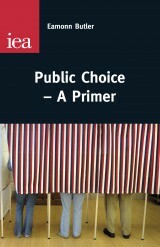 The good folks at the London-based Institute for Economic Affairs have just released an excellent book by Eammon Butler, Public Choice: A Primer. You can order a copy or download a free PDF version at this link. Public choice is essentially applying the economic way of thinking to politics; a volume in the collected works ofpublic choice founding father Gordon Tullock is even titled The Economics of Politics. Most economics is about private decision-making by individuals or firms. Politicians, regulators, and voters make much more public choices, hence the name of the field. Many people think that politicians and regulators are different from other people. Instead of acting selfishly, they act in the public interest. Public choice depends on the controversial claim that people are people; government acts selfishly, too. Politicians want to be re-elected. Bureaucrats want to enlarge their mission and budget, and to get that next promotion. These very human concerns affect the decisions they make and how they do their jobs. In short, just as there is market failure, there is government failure. That’s why Butler’s new primer should be required reading for everyone who works on Capitol Hill. If it doesn’t cause a wave of resignations, staffers would at least have a more realistic perception of how their colleagues behave, as well as the people who vote for them. This entry was posted in Books, Economics, Public Choice and tagged arthur seldon, eammon butler, gordon brady, gordon tullock, government failure, iea, william mitchell. Bookmark the permalink.